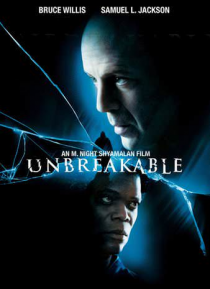 Bruce Willis and Samuel L. Jackson star in a mind-shattering, suspense-filled thriller that stays with you long after the end of this riveting supernatural film. After David Dunn (Willis) emerges from a horrific train crash as the sole survivor -- and without a single scratch on him -- he meets a mysterious stranger (Jackson). An unsettling stranger who believes comic book heroes walk the earth. A… haunting stranger, whose obsession with David will change David's life forever.